Devices A device is any “thing” that Indigo can interact with - usually it's some kind of hardware (light switch, appliance module, motion sensor, etc), but devices can also be other non-hardware things (iTunes server, calendar, etc). Triggers A trigger is generally some kind of “event” that occurs. Indigo can use that event to execute actions in response. Schedules A schedule is similar to a trigger, but the event that causes the execution of the actions is a temporal event of some kind. Either a fixed point in time (5/2/2011 at 1:00pm) or more likely some repeating time (every day at 1:00pm). 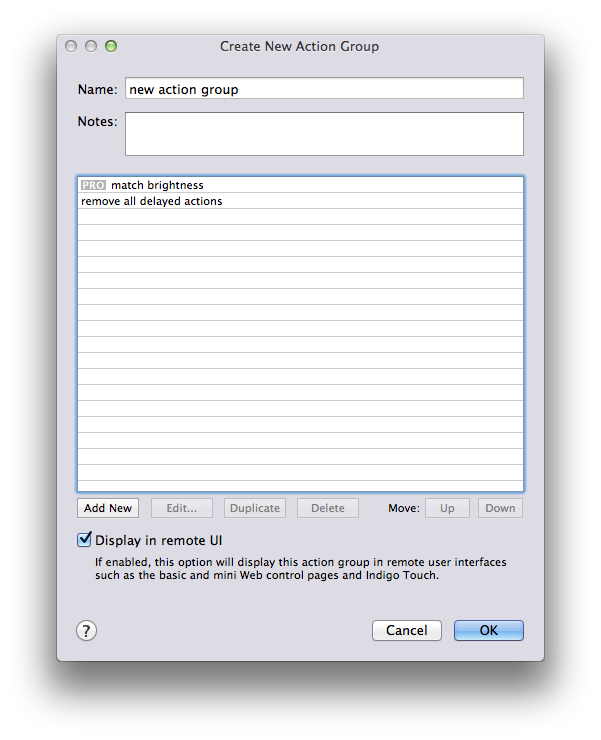 Action Groups Action Groups are collections of actions that may be reused (and modified) easily between multiple triggers, schedules, and control pages and executed via various clients (the Mac Client, the Indigo Web Server (IWS) web pages, Indigo Touch, etc). Control Pages Control Pages are user-created interfaces to control their Indigo system - for instance you could create a graphical floor plan with light icons in the various rooms. Variables A variable is a place where your home automation logic can store information that changes during the normal operation of your home and that can be used in other parts of your system: for instance, you can have a variable that represents whether your home is occupied or not - then you can have special automation logic that takes place when that variable changes. That is the very high-level definition of the primary objects in Indigo. If you don't find what you're looking for there, check out our Glossary of Terms which includes just about every term we can think of that you might run across. Next, we want to go into a little more detail about each of the main object types to help you understand when and why you would want to use them. Devices in Indigo are “things” that Indigo can interact with. 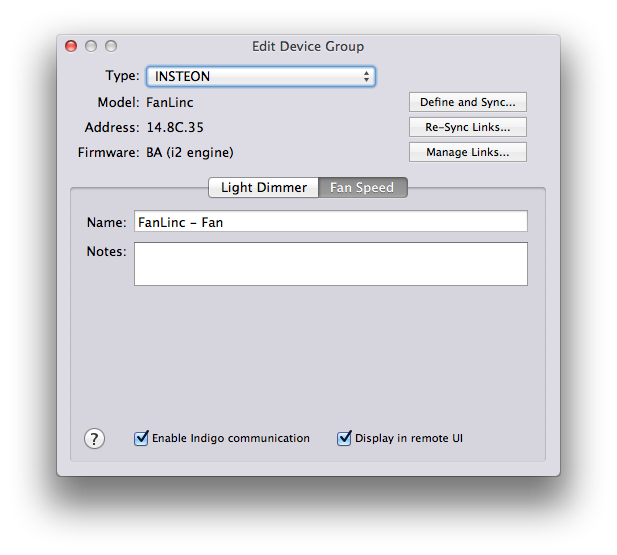 Not only can Indigo interact with Z-Wave®, INSTEON, and X10 devices but Indigo also supports devices provided by third party plugins. This greatly expands the kind of devices that can be defined in Indigo. If you add other 3rd party plugins that supply devices, they will show up on the Type menu as well. There are over 95 3rd party plugins listed on our Plugin List that cover many other types of devices, including alarm panels, media servers, A/V equipment, and much more. If you're a programmer and would like to develop plugins, check out our technical documentation section for all the docs you need to get started building Indigo plugins. Inside each tab, you have the Name field, which represents the unique name of this device. Next you have the Notes field - it's a free-form text field that you can put anything into you want - perhaps to help describe what features you're using, where it's physically located, or significant triggers that use it. You can put whatever you like in that field. Enable Indigo communication checkbox - this is useful if you have a device that you're temporarily taking out of service or moving. If you uncheck this checkbox, Indigo will not attempt to communicate with it in any way - so you won't receive errors in the Event Log when any action is taken for this device. 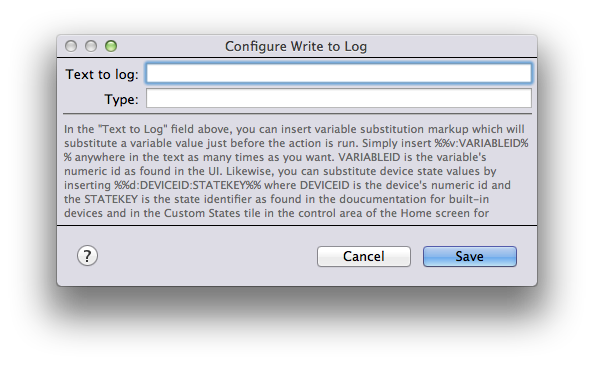 Display in remote UI checkbox which, as it says, lets you see this device in remote client applications. To get started adding devices to Indigo, visit the page that's appropriate for the technology you're using: Z-Wave, INSTEON, X10, or visit the documentation for the plugin that supports the devices you want to add. We'll look at each of the specific trigger types next, but first I'd like to point out a couple of other features. First, you'll notice that there are three tabs in the dialog: Trigger, Condition, and Actions. 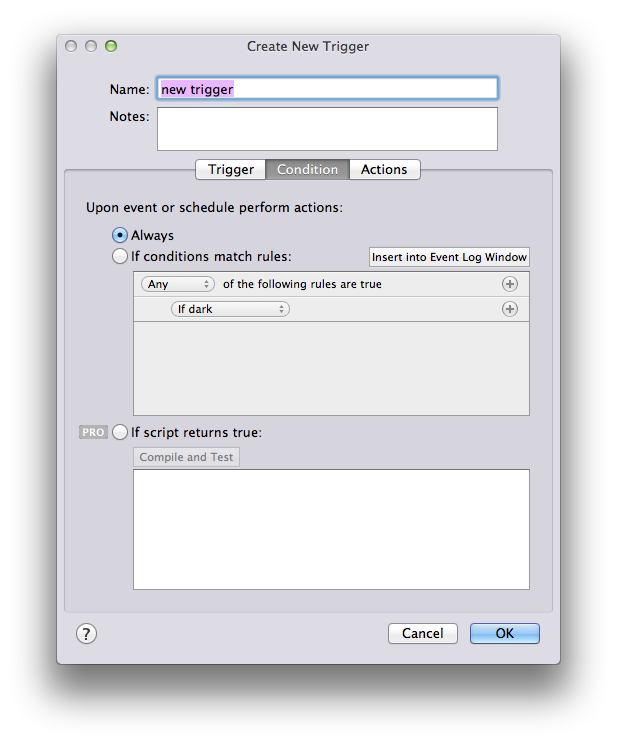 The first tab lets you define the trigger event. The second allows you to specify conditions which will be evaluated at runtime to determine whether the actions should be executed. See the Conditions section for more information. Lastly, the Actions tab allows you to define the actions that this trigger will execute. See Actions and Action Groups for more information. 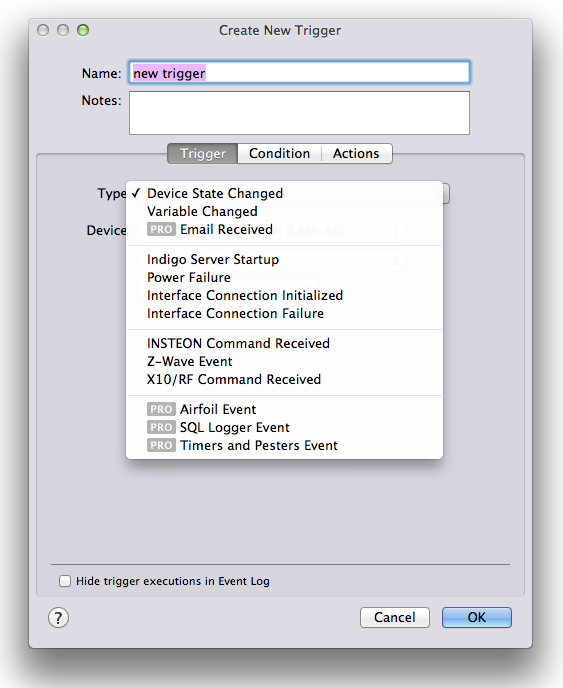 Let's look at the various built-in events that Indigo can use in triggers along with their dialogs. Use the Type Device State Changed to trigger an action whenever a device's state changes. For example, you could create a Trigger Action for whenever a specific light's brightness becomes greater than 75% or for when your thermostat's temperature drops below 55 degrees. A device state can change as a result of the following: a direct INSTEON or X10 command sent to that device from a remote control or motion detector, a device action Indigo has sent the device, or the reception of a new status state from the device itself. Unlike INSTEON modules, not all X10 modules transmit their current states when they are changed directly at the device itself. For example, in order for Indigo to know that you have turned a hallway light on at the light switch itself, the light switch module must be a 2-way module that can transmit X10 signals back to Indigo. We recommend that our users only purchase these 2-way X10 modules in cases where Indigo needs to be aware of the status changes triggered at the device itself. Each X10 transmitter in your system will reduce the X10 signal strength throughout your home wiring. TIP: Read our online troubleshooting information page if you are having problems reliably sending or receiving INSTEON or X10 commands. Use the Type Variable Changed to trigger an action whenever an Indigo variable value changes. Variable values can change as a result of a Modify Variable action or from the user directly modifying the value. See the Variables section for more information about using variables. Note: becomes true will fire when the value becomes “true”, “on”, “yes”, and “1” (if it wasn't one of those values previously). becomes false will fire when the value becomes “false”, “off”, “no”, and “0” (if it wasn't one of those values previously). Any other value will be neither true nor false and neither will fire. 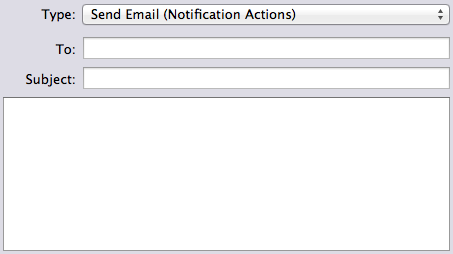 Use the Type Email Received to trigger an action based on emails sent to Indigo. You can trigger an action if any email is received, or restrict the trigger to emails that contain phrases within the subject title and/or specific sender email addresses. 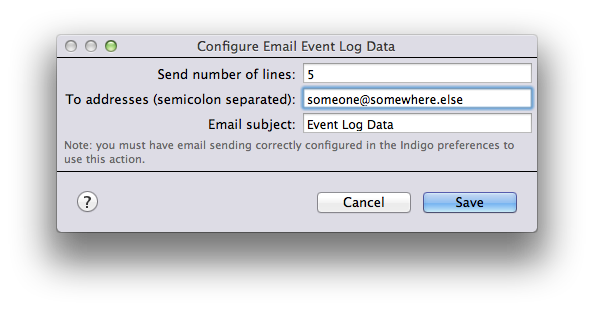 See the configuring email settings section for more information about having Indigo send and receive emails. Use the Type Indigo Server Startup to trigger an action when the Indigo Server process is first launched. There are no options so we aren't showing that dialog. Use the Type Power Failure to trigger an action whenever the computer interface detects a power failure. For Indigo to receive this information from the computer interface, the computer running Indigo must be connected to an uninterruptible power supply (UPS). Otherwise, the command from the interface will be sent to a computer with no power. Use the Type Interface Connection Initialized to trigger an action whenever the communication between Indigo and the interface is successfully started. Use the Type Interface Connection Failure to trigger an action whenever the communication between Indigo and the interface fails. An unplugged USB cable or a malfunctioning interface can cause this error. Use the Type INSTEON Command Received to trigger an action when INSTEON commands are sent from a device, like a KeypadLinc, and then received by the PowerLinc interface. Select the INSTEON command from the Received popup that you want to cause the trigger, along with the Device from which the command was sent. For devices with multiple buttons, like the KeypadLinc and ControLinc, you can also choose which button press causes the trigger via the Using button popup. TIP: The Double Tab On and Double Tap Off command types are useful for triggering lighting scenes at a wall switch (like the SwitchLinc). For example, you could create a Double Tap Off trigger action that turns off all the lights in the house when a SwitchLinc near the back door is pressed twice. TIP: Read our online troubleshooting information page if you are having problems reliably sending or receiving INSTEON commands. Use the Type X10/RF Command Received to trigger an action when X10 commands are sent from a device, like a PalmPad, SwitchLinc 2-Way Dimmer, etc, and then received by the X10 or RF interface. Select the X10 command from the Received popup that you want to cause the trigger, along with the Device or X10 Address for that command. Choose A/V Button Pressed from the Received popup to trigger an action using one of the X10 universal remote controls, such as those included in the X10 “Entertainment Anywhere” kits. TIP: Read our online troubleshooting information page if you are having problems reliably sending or receiving X10 commands. 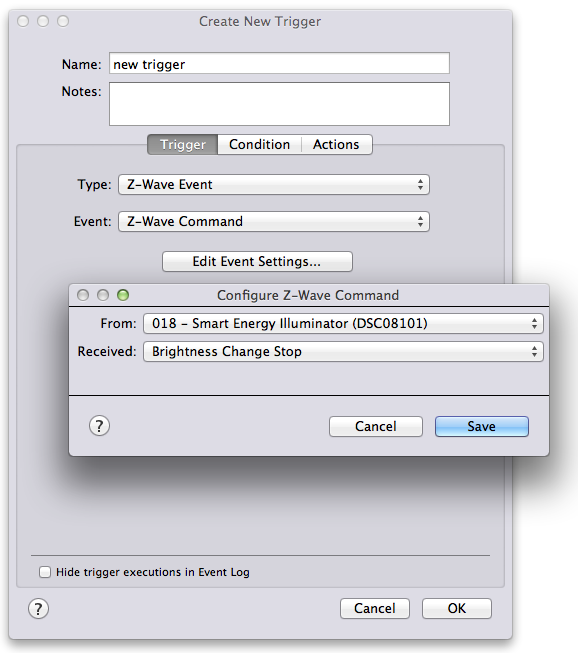 Plugins may define events as well - these will be listed below the X10/RF Command Received event in the Type popup. 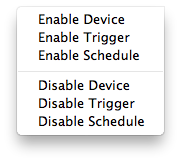 As with trigger dialog, the schedule dialog has 3 tabs: Schedule is for specifying the temporal settings; Condition is for specifying further conditions that can determine if the actions are executed, and finally the Actions that will execute. Conditions and Actions are discussed in a later section. The two main sections of the Schedule tab separate the temporal settings into two parts - the time of day and the date. Every X hours Y minutes Z seconds - this is the typical repeating setting. You can also randomize all of the above settings by entering a non-zero value in the Randomize by text box. Each execution will add the randomized amount of time. Use this setting to create schedules that have that “lived in” look. Optional End on date so you can specify an absolute date on which to stop any repetition. There are two options at the bottom of the dialog. The first is Hide executions in Event Log which will suppress any log messages indicating that this schedule has executed. This especially useful for schedules that repeat very frequently (every X minutes for instance). 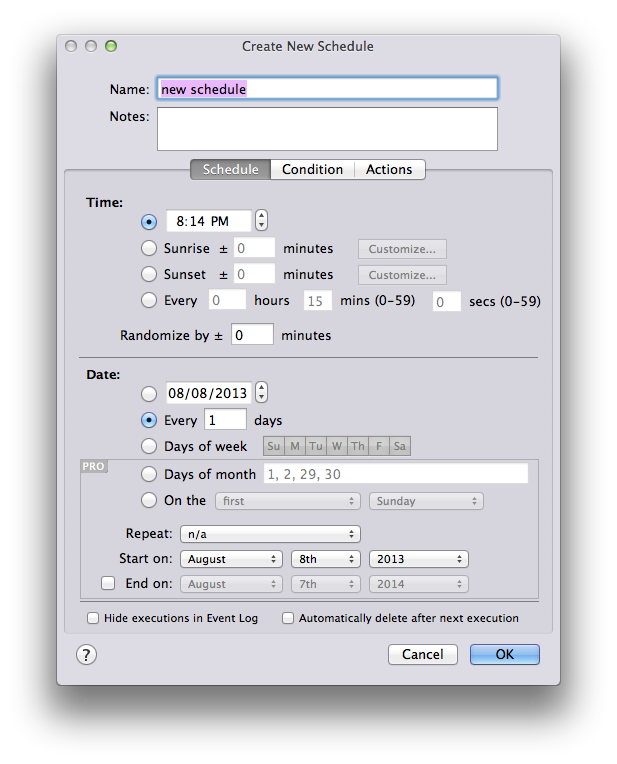 The second is Automatically delete after next execution which will do exactly that - after the next time that the schedule executes it will be deleted regardless of the time or date settings. Actions are the individual commands that Indigo will perform: turn on a light, send an email, etc. You can specify as many actions as you like for each Trigger, Schedule, Action Group, and Control Page element. Actions are grouped into 6 main categories (some of those categories have subcategories) and then below those there is a category for each plugin that provides actions that aren't integrated into other menus. 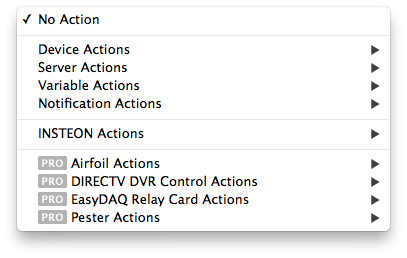 The Device Actions category has 7 subcategories. Plugins can also add a submenu to this category for the actions they define that work directly on devices. 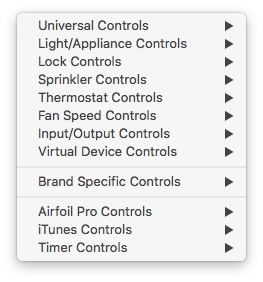 By default, Indigo ships with the Airfoil Pro, iTunes and Timers and Pesters plugins, which add subcategories to this menu. You may have other menus as well if you've installed 3rd party plugins. These controls are either universal across most devices or are available on some specific types of devices (KeypadLincs for instance). Request Full Status Update - ask the device to reply with all possible status information. This is dependent on the capabilities of the device. Request Energy Update - ask the device to reply with only it's energy usage information. This is dependent on the capabilities of the device - many do not support energy monitoring. Reset Energy Usage - ask the device to reset the running total of energy usage. This is dependent on the capabilities of the device - many do not support energy monitoring. Turn On Keypad Button - turn on the specified button' light on the device. Only applies to devices which have separate buttons that indicate state with a light. Turn Off Keypad Button - turn off the specified button'light on the device. Only applies to devices which have separate buttons that indicate state with a light. Beep Device - ask the device to beep. This function is dependent on the capabilities of the device. These controls are for lights and on/off (sometimes called relay) devices. All Off - turn off all light and appliance devices. The Devices: popup lets you select All INSTEON/X10, All INSTEON, All X10, or a specific X10 house code. Match Brightness - set the brightness of any number of dimmer devices to the value of the selected dimmer device - so you can quickly and easily create a very simple scene. Set RGBW Levels - set the RGBW levels for lights that support setting their color. 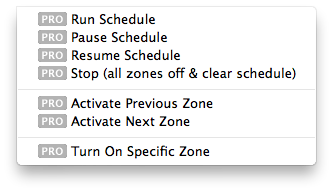 Run Schedule - selecting this action will show you the zone table (shown above) that will allow you to set the duration for each zone and optionally multiply those durations by the selected variable. This last option is useful if you change durations based on time of year - you can change the variable value but keep the existing schedule and it'll adjust the duration as appropriate. Cycle Through Thermostat Modes - this will allow you to easily cycle through thermostat modes in this order: Off, Cool, Heat, Auto. Especially useful in conjunction with the “Thermostat Mode+.png” image on a control page - just add this as a server action and you have a simple control for adjusting the thermostat mode - each time you tap/click the image, the thermostat selected will cycle to the next mode just like pressing the Mode button on the thermostat itself (if it has one). Toggle Thermostat Fan Mode - like the action above, this method will toggle between the two fan modes: Fan On (always on) and Fan Auto (automatic). Again, useful with the “Thermostat Fan Mode+.png” image file. v1 INSTEON thermostat adaptors didn't broadcast out changes to update it's internal state representations for the thermostats - which is why there are so many options to get status. Indigo 7 catches the v2 thermostat update broadcasts so the need to manually get updates should be reduced. Cycle Through Speed Control (FanLinc) States - use this action to cycle through the fan speeds in this order: High, Medium, Low, Off. It's basically an electronic version of pulling the fan's chain. Update Device Group Saved State - updates the saved state of all devices in a device group so the next ON command will match their current settings. Set Virtual On/Off Device State - explicitly sets the state of a virtual on/off device. Useful if the state gets out of sync or is not maintained by a variable. 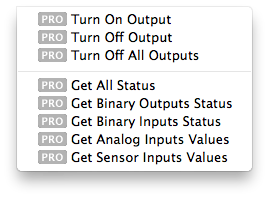 Note: in versions earlier than Indigo 7.2, these commands are on the Insteon Actions menu described below. Set LED Brightness - set the brightness of the LEDs on certain devices. Newer KeypadLincs are supported as well as some SwitchLinc models. Unfortunately there isn't really a way to tell you which devices are supported so you'll just have to try it and see if it works. Turn On/Off KeypadLinc Buttons - turn on/off groups of buttons. Why not just have multiple actions using the built-in Turn ON/Turn OFF LED actions? Because each of those requires a lot of INSTEON traffic - and if you need to set several buttons at once this action will do it in one (or two if you want to maintain some buttons) action(s). It's more efficient and easier to configure (one action versus potentially seven actions). Select the action you want to take for each button: Turn On, Turn Off, Leave Alone. The latter option will require that we query the KPL to find the states first so if you select that for any of the buttons the action may execute a bit slower than it would otherwise. Note: using this action, which is sending raw INSTEON commands through the IndigoServer, will cause the KeypadLinc's button states in Indigo to become out of sync. This is because the server doesn't know that you're changing the button states given that it's just a raw command message that it's being asked to send to the PowerLinc. If you need to keep the states in sync then add another action to do a status request to the KeypadLinc (after a short delay to avoid collisions). Set KeypadLinc Auto-Off Button Group - specify what buttons will go off automatically when you press any other button. Useful in conjunction with Toggle Mode below for creating “radio groups”. See the FanLinc and KeypadLinc article for usage examples. Set KeypadLinc Button Toggle Mode - specify whether a button toggles (alternates between ON and OFF when pressed) or whether it sends a single command anytime it's pressed (can send either ON or OFF). Useful in conjunction with Auto-Off groups above for creating “radio groups”. See the FanLinc and KeypadLinc article for usage examples. Set Motion Sensor LED Brightness - set the brightness of the LED that flashes inside the motion sensor when motion is detected. While the brightness value is between 0 and 255, 0 does not mean the LED is completely off - it's just very dim. Note: only revision 2 Motion Sensors with jumper 5 set can be configured. Set Motion Sensor Timeout - set the timeout value between the time the motion sensor stops detecting motion and when it sends the OFF command. The timeout values work like this: 0 is equal to 30 seconds and 255 is equal to 2 hours. Values in between are proportional to those values. Note: only revision 2 Motion Sensors with jumper 5 set can be configured. Set Motion Sensor Day/Night Sensitivity - set the sensitivity for when the motion sensor detects changes from dawn to dusk and vice versa. The sensitivity values work like this: 0 will make the sensor register day all the time and 255 is equal to night all the time. Values in between are proportional to those values. Note: only revision 2 Motion Sensors with jumper 5 set can be configured and Motion Sensor II models will interpret 0 as 3. Set I/O Linc Momentary Mode - set the momentary mode of an I/O Linc to A, B, C, or None (the built-in UI only sets A or None). Trigger Watts (0 to 1800 watts in 0.5 watt steps): the wattage needed before the SynchroLinc broadcasts. Threshold Watts (aka hysteresis, 0 to 127.5 watts in 0.5 watt steps): tolerance before on/off toggle is sent. Delay Seconds (0.15 to 38.25 seconds): prevents message flooding if thresholdWatts is too low. Set LED Mode - set the mode of the LEDs on the switch. The default Normal (load status) behavior is for them to represent the brightness to which the switch is set. You can set the switch to Status (custom status) which will allow you to individually turn on and off each LED and set it's color. You can also set the bottom LED's behavior. Set LED Color and On/Off State - when the switch is in Status mode, you can use this action to turn on/off and set the color of any of the LEDs. Set LEDs Blinking Behavior - start/stop LEDs from blinking. The Server Actions category has three actions and three subcategories. Select an action group from the popup to execute. This action will attempt to reset all built-in hardware interfaces. There are no options. 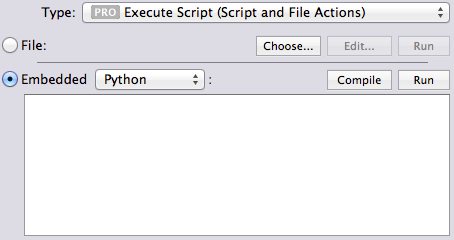 The Execute Script action allows you to execute either a Python or AppleScript as an embedded script or stored in a script file. In general, you should use embedded scripts for scripts that are short and very quick to execute. Embedded Python scripts will be limited to 10 seconds of execution time - if they run longer than that they will be killed. If you have a Python script that is a long running script you should save it in a separate file and execute it from the file by selecting the File radio button then selecting the file. Python scripts executed from files are executed in their own process and are therefore much less likely to adversely effect the server process if they don't work as expected. Embedded AppleScripts must run on the server's main execution thread so if it delays, can hang on external events like network access, or otherwise does a lot of processing, then everything else in the server will be put on hold until the script is finished. Therefore, you definitely should keep embedded AppleScripts very simple. As with Python scripts, long running AppleScripts should be stored in a separate AppleScript file (created with Script Editor) and executed that way - external AppleScript files execute in their own process and are therefore much less likely to adversely effect the server process if they don't work as expected. For embedded scripts, you can click the Compile button and we'll do our best to check the script for syntax errors. Click the Run button to have the script executed immediately. This will open the specified file (full path using *nix slashes (“/”)) using the default application. If it's the path to an application (e.g. “/Applications/TextEdit.app”) then it will launch that app. You can also add command-line options and include markup that will do variable (%%v:VARIDHERE%%) and device state (%%d:DEVIDHERE:STATEIDHERE%%) substitutions. Note: file paths that contain spaces will need to have the spaces escaped with a backslash - /some\ path/that\ has/escaped\ spaces/. This will run the specified script file optionally with the output being inserted into the specified variable. 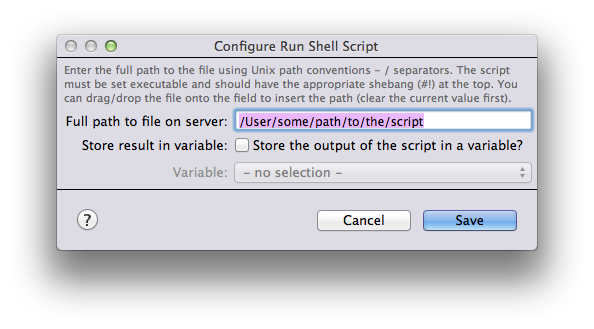 The script must be marked executable and a valid shebang (#!/path/to/shell) must be specified at the top of the script. Note - this won't work for AppleScripts - you should use the built-in Execute Script action and select the script file that way. Also, if you're running a Python script you'll probably just want to use the Execute Script action since script files run from this plugin won't have access to the IOM (import indigo, which is Python-only). This will write the specified text into the event log - optionally with the specified type string. This action will send an email to the specified email addresses that contains the specified number of lines from the log file. This is useful for debugging problems (among other things). Tip: this action is also available interactively by selecting the Help→Email Log… menu item. This action will enable Indigo communication with the selected device. 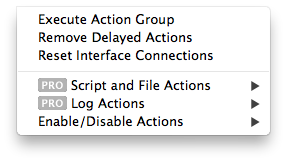 You can specify an optional complementary Auto-disable after X minutes action. 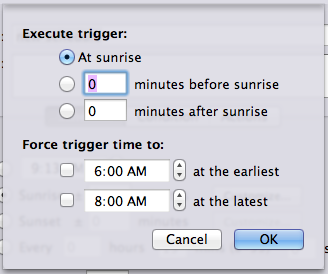 This action will enable processing of the selected trigger. You can specify an optional complementary Auto-disable after X minutes action. This action will enable processing of the selected schedule. You can specify an optional complementary Auto-disable after X minutes action. This action will disable Indigo communication with the selected device. You can specify an optional complementary Auto-enable after X minutes action. This action will disable processing of the selected trigger. You can specify an optional complementary Auto-enable after X minutes action. This action will disable processing of the selected schedule. You can specify an optional complementary Auto-enable after X minutes action. There are three actions that are specific to variables. 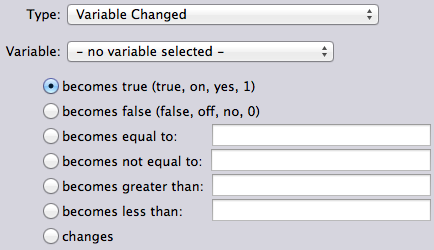 Select a variable to modify, then select the options. This will insert the selected state of the selected device into the specified variable. 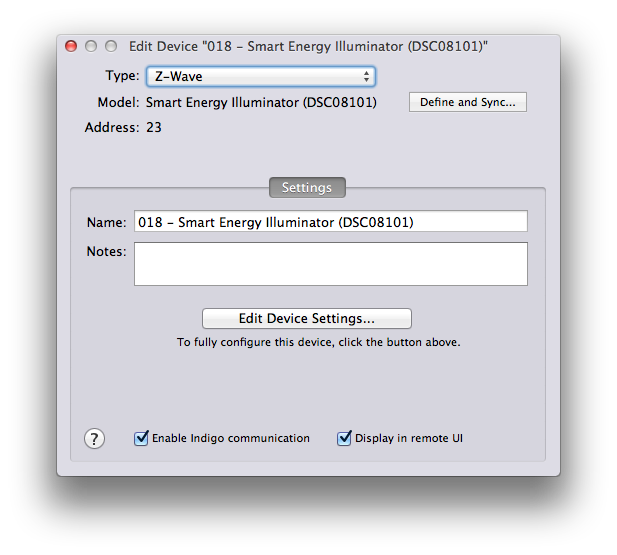 After you specify the device, click the Edit Action Settings… button and it will open a dialog (shown above) with a list of all possible states for the device you selected and a popup of all variables. You can create a trigger that executes when a device's state changes and have it insert the new state into the variable. Click the Edit Action Settings… button and it will open a dialog (shown above). Here you will select the variable and, optionally, the format string as defined in the Python datetime string formatting documentation (see the chart at the bottom for format specifiers). The format in the Format string field is the default format. Click the Edit Action Settings… button and it will open a dialog (shown above). 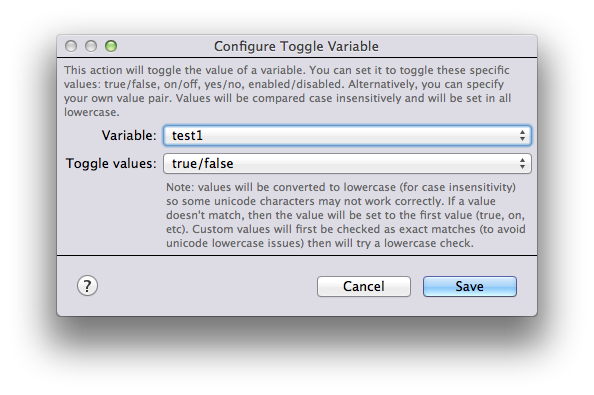 Here you will select the variable and the values that will be toggled. The first 4 options (true/false, on/off, yes/no, enabled/disabled) on the Toggle values menu are self explanatory (although note that values will be converted to lower-case for comparisons). The last option, Custom Values, will allow you to specify the values. We will first try to match the custom variables without converting to lower case (some unicode characters behave oddly when lowercased) and if we don't find a match then we'll convert. Finally, if nothing matches, we'll just set the value to the first value. Click the Edit Action Settings… button and it will open a dialog (shown above). Here you will select the destination and source variables. In the standard install of Indigo, there are two actions: Send Email and Growl Notify. Plugins are allowed to add menu items to this category so there may be more options if you've installed some 3rd party plugins. Enter the email address, subject and the body. See the Growl plugin documentation for details. Note: In versions earlier than Indigo 7.2, the menu items in the Insteon Brand Specific Controls menu were in the above menu. 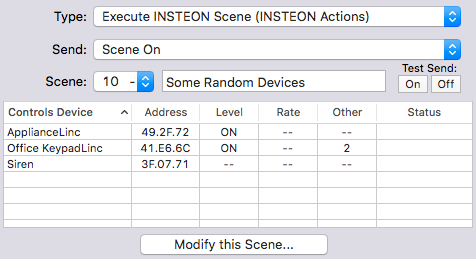 The Scene: popup represents the INSTEON scene number - any name that you've assigned to that scene will also show up in the text field beside it (you can change the name there also if you like). Use the Send On and Send Off buttons to test your scene commands. The table will show you what devices are in the scene. The columns are pretty self explanatory perhaps with the exception of the Status column. That column shows the status of the device's settings in the scene (edited, added, deleted, etc.) because you can modify scenes without actually performing the link sync. If you have a scene that isn't working correctly the value in that column might help you understand why it isn't working. Finally, if you need to add, modify, or delete a device from the scene, click on the Modify this Scene… button. See the Indigo and INSTEON Link Management page for more details. This action will allow you to send a raw INSTEON command to any INSTEON device. You can send standard messages (2 bytes) or extended messages (16 bytes). You can also have the results of the command inserted into a variable for later processing. You can then Duplicate or Delete the selected action, or use the Up / Down buttons to reorder the list of actions. To edit a specific action's settings, double-click on the action or press the Edit… button. While you can order the actions in any order you like, Indigo will attempt to execute all actions in parallel. It's not always possible for various reasons, but that's the intent. If you want to order the execution, then you'll need to add delays which will delay the action's execution from the time of the event. So, if you have 3 actions and you want the first to execute immediately, the second to execute a minute after the event, and the third to execute two minutes after the event, then add a one minute delay to the second and a two minute delay after the third. Action Groups are groups of actions that can be specified separately from Trigger, Schedule, and Control Page elements, so that they can be reused. For instance, if you have a group of lights you turn on at the same time, you can create an action group for those lights and just execute that group as part of the various triggers, schedules and control page elements. If you need to add a light, you only need to add it to the group rather than edit each individual trigger, schedule, etc. that needs to control that group. Action groups are also optionally shown in remote clients so it's an easy way to control some collection of devices from those clients without having to adjust each one manually. Select Action Group List from the View menu. Press the New… button at the top of the main window. Optionally give the group some Notes. Indigo includes a built-in Web server that allows remote execution of your Action Groups from Indigo Touch or any modern Web browser (Safari, Firefox, Opera). Follow the instructions in the Starting Indigo Server section of the Getting Started guide to make sure that the following options are enabled: Start and connect to Indigo Server on this computer, Allow remote access, and Enable iPhone, iPod touch, and remote Web browser access. The Display in remote UI option at the bottom of the dialog will make this action group show up in remote clients like Indigo Touch or the web pages. When you see them in those UIs you can tap/click the action group and it will be executed so it's an easy way to control scenes from those clients. 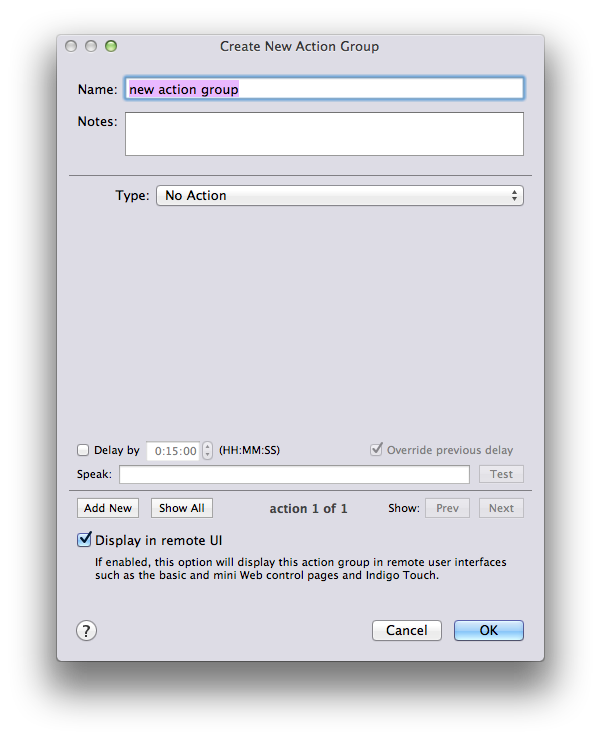 TIP: if the Action Group is in a folder, that folder must also be marked for Remote Display. Control pages are graphical pages that you use to control Indigo, either through a web browser or Indigo Touch. 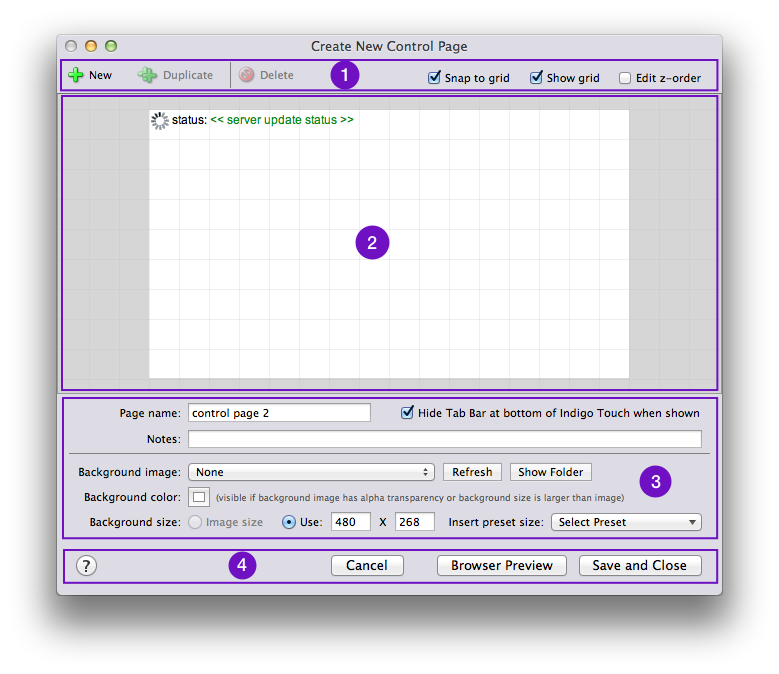 Indigo has built-in control pages available on the web (Indigo Touch has built-in base functionality that matches them), and also allows you to design custom graphical pages - from the background image and/or color to the placement of text labels, control images, and what actions clicking/tapping on those images performs. The editor window has 4 areas - the first is the the global control area. In this area you'll find buttons to create new page elements (labels, controls, etc), duplicate existing elements, delete elements, and turn on/off some features of the editor. Select Snap to grid to have page elements snap to a grid that overlays the design area (see the next item). Select Show grid to show the aforementioned grid. Select Edit z-order to show you the order of the page elements and allow you to change them. Higher numbered elements are drawn last, so if you have overlapping controls the one with the highest order will be drawn last. The second area is the design area. This is where you'll graphically lay out your control page. It operates much like many drawing programs - you select objects and drag them around to position them. The default new control page contains two elements: a graphical server status icon and a server status text area. 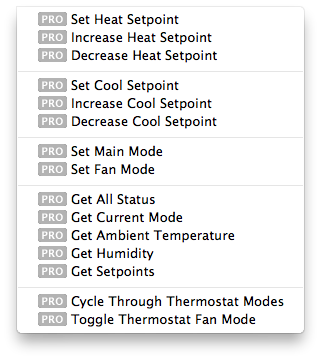 By the way, you can have only one of each of these element types on your control page. 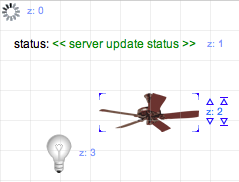 In the example above, you see 4 page elements: the graphical server status element, the server status text area, a device state element using a ceiling fan image, and another device state element using a lightbulb image. The ceiling fan element is selected, as you can tell by the blue brackets at each corner of the image. Because I also have the z-order checkbox selected, you see the z: # next to each element, and above and below that for the selected element you see up/down arrows, one with a line above/below and one without. The arrows that aren't pointing to lines will move the element up/down one step at a time. The arrows that point to lines will move the element to the top/bottom of the element hierarchy. If you have a page element that's showing a textual description, then you'll notice a little resize icon at the lower left corner of the text - this control will allow you to adjust the width of the text field so that it can accommodate longer test. Text can only be a single line at the moment but you can make it as wide as the entire page. This is where you set global information about the page itself. The Page Name: and Description: fields are pretty self-explanatory. Check the Hide Tab Bar at bottom of Indigo Touch when shown to have the bottom navigation bar hidden when this page is viewed in Indigo Touch. You can use a Background image: by selecting it from the popup, such as a floorplan or other image. You can add your own image by creating a PNG file and adding it to the backgrounds folder (to open that folder in the Finder just click the Show Folder button - and if you add an image while Indigo is running, click the Refresh button to have it added to the popup). Note: some versions of Indigo 7 don't like spaces in the background image name so just replace spaces with another character such as an underscore. If you look closely at the numbers, you'll see that on the iPad, the Indigo Touch header that's displayed above the control page is 64pix regardless of screen orientation. However, it appears that the header is decreased to 52px when in landscape mode on the iPhone/iPod touch. This is verified in both iOS 3.x and 4.x. Page element details will vary based on what's displayed - we'll go into those details a bit later. The final section is the bottom control area - the Help, Cancel, Browser Preview, and Save and Close buttons are also pretty self-explanatory (the Help button may have gotten you to this page in fact). The Control Page editor now supports Cut/Copy/Paste between control pages as well as drag and drop. You can drag and drop page elements between pages and drop devices on a control page to add them. You can also drag control page elements to the Finder, which will create a clipping file. You can then switch databases, and drag those clipping files back onto a control page and it will import them. The clipping files will initially be titled with the XML text that's being exported, but you can change the name of the clipping file - so if you're sending it to someone else you can give it a more descriptive name. This is a good way to share groups of page elements with others. The Control Page list in the Home Window will allow you to drag Control Pages out to the Finder. This will create a clipping file that can then be dragged back onto the Control Page list (for instance, in another database) and the whole control page will be recreated. Note, however, that if the target doesn't have the same devices, variables, action groups, and images, you'll need to edit the resulting page elements. The clipping files will initially be titled with the XML text that's being exported, but you can change the name of the clipping file - so if you're sending it to someone else you can give it a more descriptive name. This is a good way to share control pages with others. To import a control page, just drag it from the Finder to the Control Page list. As we stated above, each page element represents some kind of object - also called controls. Specifically, there 6 different types of controls. When you select Device State from the Display: popup, you're shown a list of devices in the For: popup. Once you've selected a device, the next popup will show the list of states for that device. The next row of options allow you to have the control represented by an image or in text. Images may be used to represent the state of most common devices - we provide quite a few different images. If you'd like to use custom images, check out the wiki article that discusses creating and using custom images. The next row of options is for the Caption: field - static text that can be used as a label for the control. It can be placed on any side of the control (left, right, above, below) as well as centered on top (good for buttons). The next two options, Client action: and Server action: allow you to specify what happens when the control is interacted with (via click or tap) and are describe in separate sections below. Variable Value controls have the exact same options as device state controls, but rather than use the device state it uses the value of the variable you selected in the For: popup to select the correct image or as the text to display. Static Image/Caption controls are simpler than the other controls: they can have an image and/or static text caption. Refreshing Image URL controls allow you to specify a URL to an image that is refreshed periodically (specified in the Refresh rate: popup). Just specify the image size, URL, and refresh rate. This control will show the latest status update message from the server as text. You can have only one of these controls on your control page. This control will show a spinning icon when the server is performing some request for the control page. You can have only one of these controls on your control page. Link to URL - this will cause the client to open the provided URL in a browser window (a new browser window if the Open in new window checkbox is checked).In Indigo Touch, it will cause Mobile Safari to open and show the page specified by the URL. Every page element may also have server actions performed - these are the typical actions described above. Just like Triggers and Schedules, you can specify a single action or multiple actions. Variables are used to hold information that can help your home automation logic. 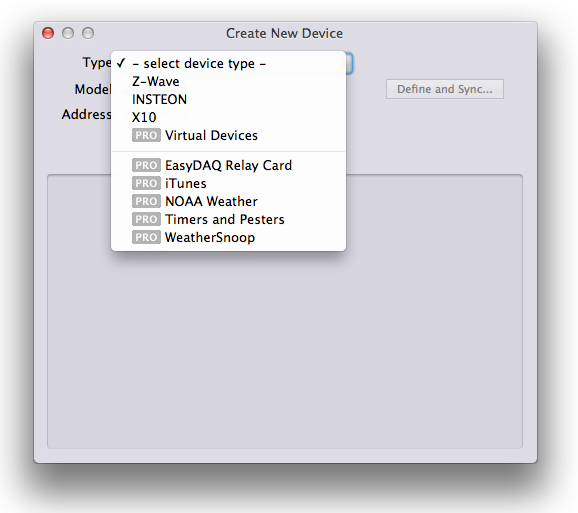 For instance, Indigo ships with an AppleScript which stores weather information in variables. You can use that information to display on control pages, as part of your conditional logic (see Conditions below), or as a trigger for some other action. This window is broken up into 3 sections. The top section lets you create new variables, duplicate existing variables, and delete variables. It also lets you search your variable list (either name or value) by typing some text into the search box. The middle section is the actual variable table. It actually has two parts: the table header and the table itself. If you right click on the table header, it will allow you to customize what columns show up in the table. To change a variable Name, just double click on the name and type in a new name. Note that variable names can contain only alpha-numeric characters and underscores “_” and must be unique. Variable values may contain pretty much anything and can be changed by double-clicking on them. 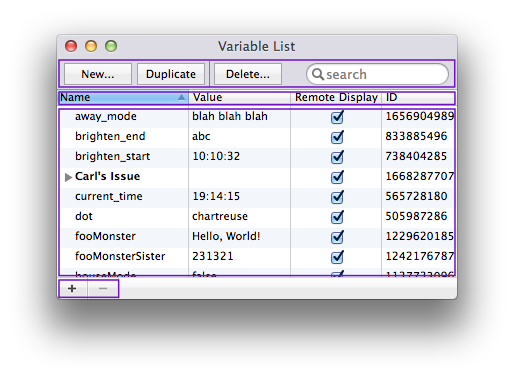 The Remote Display column indicates whether a variable will be shown in the built-in variable list in remote clients. The ID column shows the unique identifier for the variable - you'll need this if you're planning on writing Python scripts. If you right-click a variable, you can toggle the Remote Display attribute or copy the variable id to the clipboard (for easy pasting into scripts). You can also select the Show Dependencies option to open a window that shows all other objects that are dependent on that variable. See Deletion Dependencies for more information. The bottom section are the folder control buttons. Clicking on the plus (+) will add a new folder, and clicking on the minus (-) will delete the selected folder. If the folder isn't empty when you try to delete it, a sheet will come down prompting you to decide if you want to delete all the enclosed variables or if you want to move them out of the folder first. If you right click on a folder in the list, you can toggle whether the folder shows up in remote clients and you can copy the unique folder id to the clipboard for use in scripts. Conditions allow you to specify extra logic that's evaluated at execution time to determine if the actions associated with the trigger or schedule should be executed. Most conditions will be set to Always - in other words, there are no additional conditions associated with the trigger or schedule. However, there are many situations where you need to factor in other information at execution time that can help determine if the actions should be performed. This condition says that if the current time is greater than 6pm and less than 11:00pm then the actions will be executed. if it has rained more than 3/4 of an inch in the last 24 hours. Let's assume that you have a script running that populates Indigo variables with data from a weather station: “rain_total” holds the rain total for the last 24 hours, and “outside_temp” holds the temperature in fahrenheit. Further, let's say you have a variable, “windows_open”, that's either true or false indicating whether the windows in your house are open or not. This version says that if All the conditions are true (windows aren't open, temperature is greater than 40, and rain total is less than 3/4 of an inch) the actions will execute. Note for variable comparisons: is true will evaluate true if the value is one of these: “true”, “on”, “yes”, and “1” and will evaluate false if it's anything else. is false will evaluate true if the value is one of these: “false”, “off”, “no”, and “0” and will evaluate false if it's anything else. "All" "of the following rules are true"
"Any" "of the following rules are true"
"If variable" houseMode "is equal to" "value" "away"
"None" "of the following rules are true"
"If variable" test3 "is between" "5" "and" "10"
If, however, you still can't express your conditional logic using the rule editor, you can still select the If script returns true: radio button and write a script that returns true or false.